One of the cycle journeys I make every now and then is to a health centre where my family doctor resides. When I had to go there recently, for a simple check, I filmed the ride. This was in the morning rush hour and since I was leaving the city centre I was going in the opposite direction of a lot of people who were riding into that city centre, many of whom school children. I had shown you my ride to the dentist years ago. I still have my dentist in Utrecht, the same practice I went to as a child. That is not allowed for your general practitioner. You need to have one in your place of residence, for the obvious reason that the doctor can’t be too far away in case of an emergency. Starting in front of Town Hall at 8:07 am. If you think: “hang on, isn’t it 9:07 on that clock?” you would be right. That’s because I filmed this shot after I returned, but the actual ride did start at 8:07 am, in the middle of the morning rush hour. I start the video right in front of city hall. That’s close enough to my home. 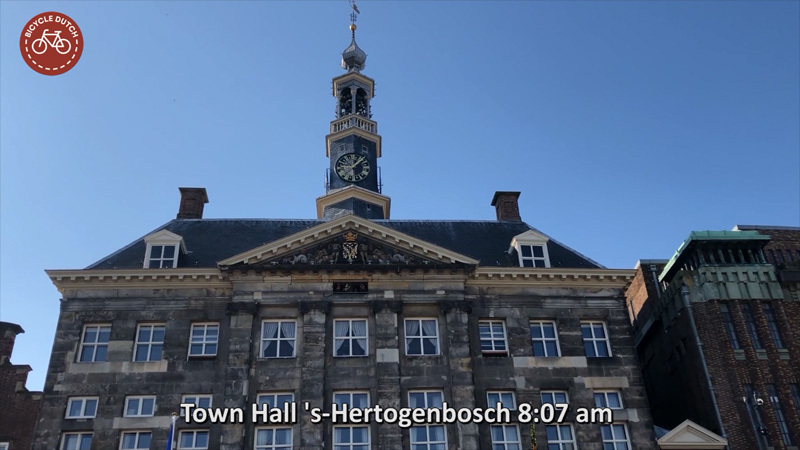 Two weeks ago a group of American politicians, councillors and even a mayor, as well as some engineers visited city hall where I gave them a presentation about cycling in ’s-Hertogenbosch. I had already spoken to the same group a day earlier in Utrecht, where I also gave them a guided tour. The guided tour in ’s-Hertogenbosch took the group to the same service street that can also be seen in this filmed ride. They were impressed by the service street that doubles as a cycle street and they wrote a blog post about it. I will show you the video first and then there is a bit of information with some stills from the ride. Every morning the market stand keepers arrive with their vans and trucks to set the market up for that day. During the delivery window that is allowed. The pedestrianised shopping streets in the ’s-Hertogenbosch city centre can all be used for cycling. During the day many more people walk here, but in the morning rush hour, when the shops are still closed, people cycling are the majority. I filmed here before, in the dark winter morning rush hour. To make it possible for the white van brigade to enter the pedestrianised area there are retracting bollards at every entrance. A one-way street for motorised traffic in the historic city centre. Cycling can take place in both directions on a counter flow cycle lane. In a traffic calmed 30km/h zone you usually do not see cycle lanes, but a counter flow lane is the exception. That is why there is only one cycle lane on this street. Cycling with the motor traffic flow is on one lane for all types of traffic. Traffic lights are almost always green for me now, ever since I downloaded the app to communicate with the traffic lights in the city, called Schwung. That is even the case in the rush hour.